I talk to The Whiskey Jerks' Gillian Snider about storytelling through songs, eclectic musical expression and sources of inspiration. Gillian Snider started out playing classical music and didn't write any original songs until she was in her early 40's. Her songwriting career began when a friend gave her an accordion. She thought ‘what a fabulous instrument!’ and started writing songs. Gillian explains, "I began playing open stages as a solo artist, but I kept hearing other instrumentation for the songs that I was writing. Saskatoon's a really small, beautiful community of musicians so I contacted a few friends that I'd played with before on different musical projects and asked if they'd like to meet in my living room once a week to learn some new and original music. Thankfully, despite very little pay, they all said, 'Yes!' "
The band's eclectic nature has led to a collaborative approach to songwriting. Gillian says, "Everybody brings their influences to the table and the songs emerge out of that process. It starts with what I present to the band, but the songs blossom from there. All of our songs seem to tell a story and the music comes out of the stories that we're telling. I’m happy to say that both Anna and Peter have also brought songs to the table - our last album ‘Neat.’ has two of Anna’s songs, and our next album will have more of Anna’s, and one or two of Peter’s as well. " She continues, “Nevin, our upright bass player, is classically trained, but is primarily a jazz musician. He's very versatile and he's in a whole string of projects too. He adds beautiful touches and riffs to the songs. And James’ lovely clarinet adds a kind of flavour that gives our sound the edge it needs to stand out in a crowd. And Anna? Well, Anna is Anna - her voice and violin speak for themselves, and her beautiful stage presence draws people like moths to a flame!" Gillian feels that she writes songs 'backwards' compared to many songwriters. She says, "I envision a character in my head and a story emerges based on that character. After I have the lyrics, I'll sit down with my accordion and get a basic chord progression and then I'll try to figure out exactly what I want to come across musically. For example, our song Baba Was a Bootlegger is about a friend of mine's Ukranian great grandmother who made illegal hooch during Prohibition and sold it help keep the family farm going. The song begins with a traditional eastern European sound, but transforms into a good-old fashioned country tune." The band's eclectic approach extends to their preferences for recording albums. In Gillian's case, she prefers live off the floor recordings. She explains, "Personally I love having the room set up so we can all see each other while we're playing. We feed off of each other's energy as a band. However I do understand the benefits of the multi-tracking process - it’s good to get things just right." She adds, "Our violin player Anna, who is a tremendous classical violin player, isn’t so much about live off the floor - she’s a perfectionist and likes her solos to be exactly how she wants them to be." The band is building momentum and playing multiple shows and festivals in western Canada, but challenges remain for them. Gillian says, "All six of us are involved in multiple musical projects and all six of us work full time too. Getting everybody organized time-wise to go on tour is very challenging. We're managing to make it work though - and we have lots of fun on the road." Over the years, Gillian has hosted a house concert series in her home. She explains, "It was a little oasis in between Alberta and Manitoba if touring bands didn't have a place to play in Saskatchewan. In just over five years, I hosted over 70 shows and I had people coming from all over Canada playing in my living room. It showed me how many musicians are playing this wonderful music right across the board. Roots is a very open category of music and I saw it manifested in so many different ways - and I only saw the tip of the musical iceberg! It's so inspiring for me to see this organic music having a resurgence across the country." In the immediate future, The Whiskey Jerks are recording a second album and getting ready to go on a tour first of eastern Canada next summer and then of Eastern Europe in 2018. Gillian says, "I just hope that we can keep doing what we're doing. Slowly but surely we're getting a wider fan base in Canada. We've been getting radio play on CBC Radio One and Two, and lots of play on community and college radio stations as well, including regular rotation on Baba Singh’s wonderful Mid-Morning Mojo show on the CKUA Radio Network." Music has always surrounded her and so she's never short of inspiration in that regard. In terms of the inspiration for the band, Gillian says, "The songs are still being written and all of the inspiration we find for the songs comes from people sharing their stories with us. I think as long as the stories are there, we're going to just keep making music." For more information on The Whiskey Jerks, please visit their website here. This profile of Gillian Snider is based on an interview conducted and recorded on Nov. 10, 2016. 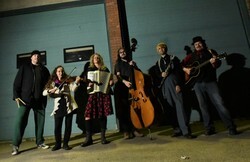 Magnolia Buckskin writes down-to-earth songs with rich harmonies and folk, bluegrass and pop influenced melodies.